BP vs. DB | there's no place like gnome. 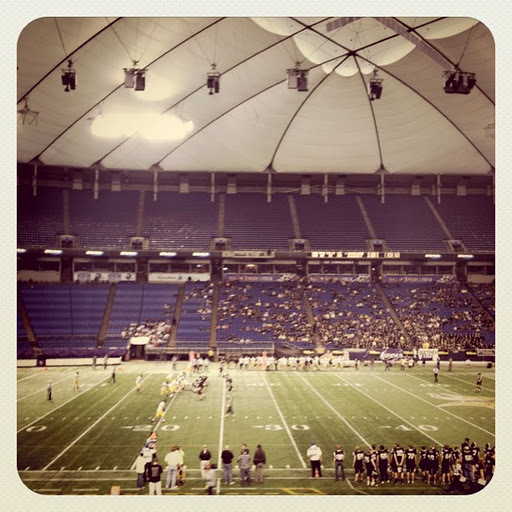 I went to the semi-final football playoff game at the Metrodome today. Dawson-Boyd Blackjacks vs. Blooming Prairie Awesome Blossoms. While I sat on the side of the team where I now reside, deep down I cheered for the team across the stadium. Talk about conflicting loyalties. It’s not that Blooming Prairie isn’t awesome or that their team didn’t deserve to win. They have worked extremely hard and have had a great season. They’ve broken records and the town united over the team going to state. They’re awesome and great and are made up of wonderful kids. Totally. Maybe there is something to be said that the amount of my life spent in Dawson at this point still outnumbers the amount of time I’ve spent in the Blooming community. There’s probably something to be said that my coworkers at Grace who remain dear friends all have kids who play on the team. There’s likely also something about my own safety, after receiving threatening text messages about my allegiance to DB. [one guess who was behind those] Nothing against Blooming Prairie but my connections with Dawson are what they are. Congrats to the DB football team as they advance to the final state game next Friday at the metrodome again. Likely another week of nerves and excitement for that small town with such a big heart; a heart worn on the sleeves of Dawson-Boyd Blackjacks apparel.